Incipit vita nova – in squid! Incipit vita nova is the motto of my alma mater, Scripps College, which means “here begins new life.” During my recent field trip to document the reproductive behavior and characteristics of the big fin reef squid, this ran through my head underwater as we watched mating pairs, quite literally, begin new life, as they mated and laid their eggs. Squid, like other cephalopods, use displays of patterns with varying levels of contrast to communicate through their skin. Through the use of chromatophore cells, which the squids can actively control the size of. These cells change sizes to hide or expose layers of pigment cells called iridiophores and leucophores in the skin. Different patterns and their intensity signal different levels of attraction and aggression for example. We got some terrific close-up footage of the chromatophores opening and closing as the squid changed colors swimming past us. After combing through some of the footage that we shot over 5 days in the Lembeh Strait, we were able to see the full sequence of reproductive behavior from advertising for a mate and male-male competition to the formation of a mating pair following by mating and subsequent egg laying. What was the most thrilling moment was when I was above the two spawning pairs in about 5 ft of water, filming their activities when one of the males that had been courting the female suddenly swooped down. He inserted his hectocotylus (a specialized arm for delivering packets of sperm) into her mantle to deposit his sperm! The female will then use these to fertilize the eggs just before she lays them. Yesterday was possibly the most productive research day I have had in months! Before the sun rose, we headed off to the fish markets in Bitung to look for harvested big fin reef squid. Normally, these squids are fished very close to shore by artisanal fisherman using lights and hand jigs. The lights attract the squid that are very active feeding during the night. Typically, a plastic glow-in-dark shrimp lure is used to jig for the squid. “Jigging” consists of throwing out a line and slowly bringing it back in with short jerky motions that mimic the movement of a shrimp in the water column until you get a bite. 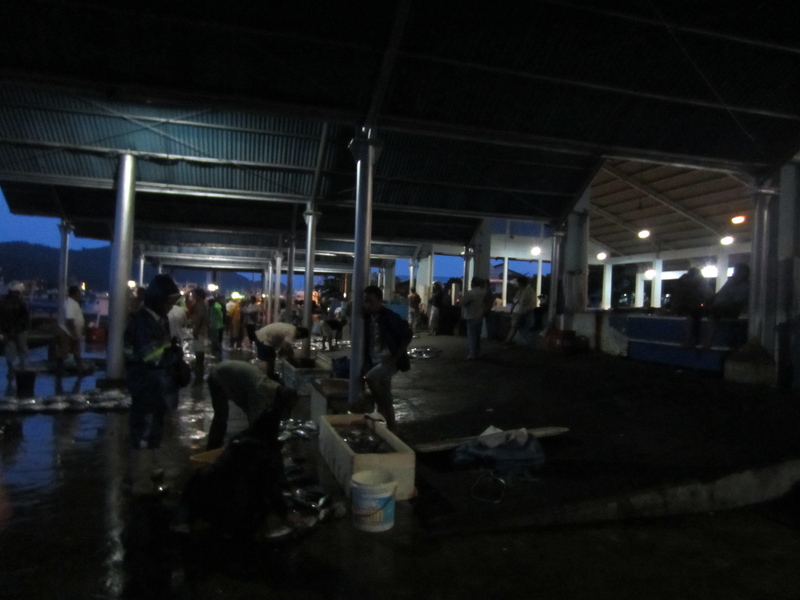 Upon arriving at the main landing/market on the harbor, we were informed that if we wanted “sotong bunga” (the Bitung term for “sotong bulat”) we would have to wait until at least 6:30 or 7:00 am before those particular fishermen got in. So after a nap in the car, we trouped off to two smaller traditional markets and left with 42 specimens (albeit with a significant amount of haggling!). Following this whirlwind fish market expedition, we set off to observe and film spawning and egg laying behavior on Lembeh Island. Upon arrival, we found a school of ~15 big fin reef squids engaging in spawning behavior over a bed of staghorn (Acropora) corals! This was extremely exciting as this is the first time I have seen my study organisms in the wild! I think I normally spend too much time staring at reef substrate looking for other things to look around and see them :-). With the help of Tyler (a fellow Barber lab graduate student) and Dimpy Jacobs (the marine biologist at critters@lembeh), we filmed ~2 hours of spawning behavior and egg laying at this site. There seemed to be one mating group that had the most interactions and patterning displays. There was a large male who kept displaying a half white – half brown pattern and flashing it as he neared the coral bed. This is similar to the “lateral silver” pattern observed in the closely related Caribbean Reef Squid (Sepioteuthis sepioidea) that is characteristic of a male guarding a female that he has mated with (Byrne et al. 2003). 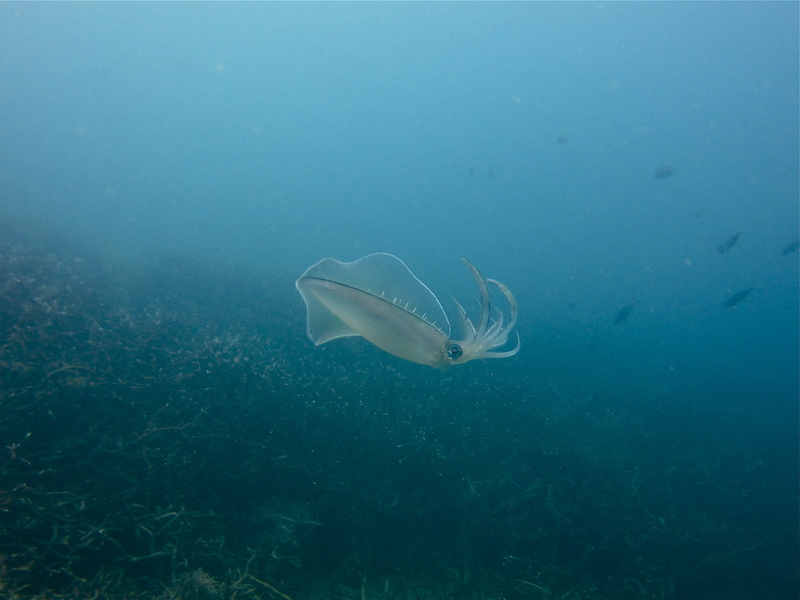 Squids are extremely communicative through visual patterning on the skin – to signal aggression, use as camouflage, and signal and attract potential mates. 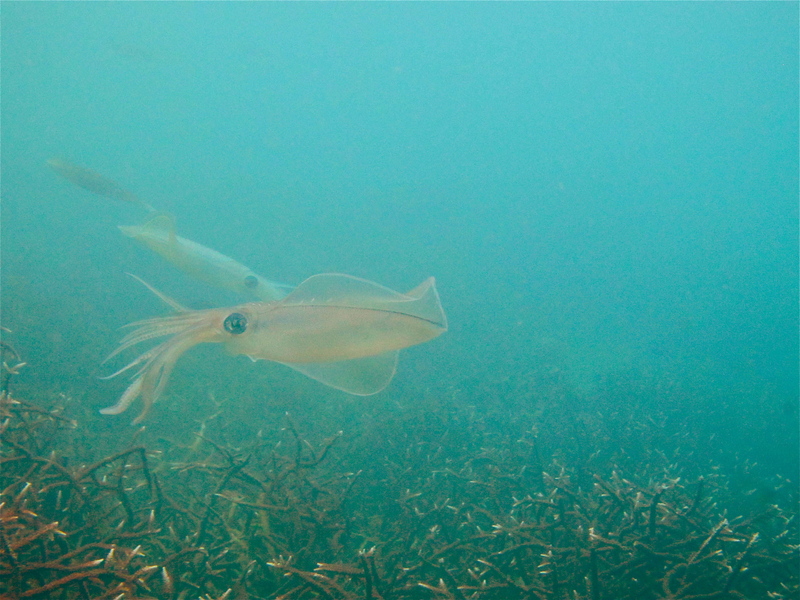 While there has been studies documenting this behavior in the Carribean reef squid (S. sepioidea) (read more about this here), this behavior has not been substantially examined in the big fin reef squid, particularly not in Indonesia. 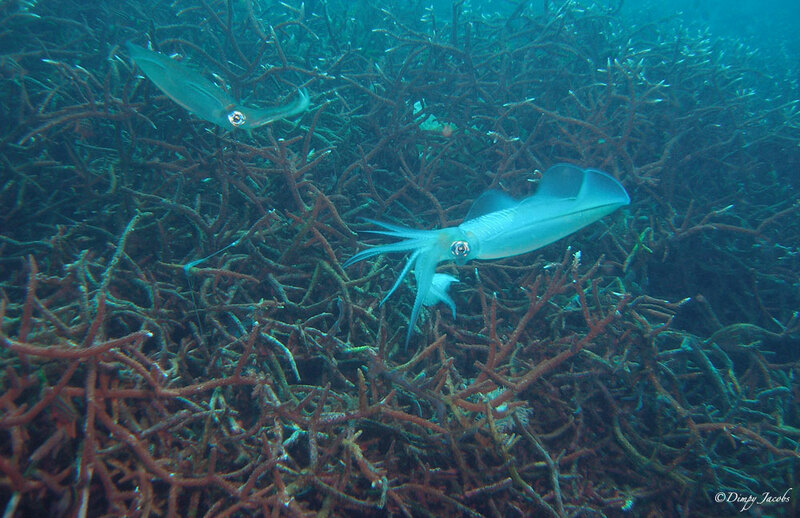 Furthermore, as my research and some previous work (namely the work from Ishigaki Island, Japan and Shark Bay, Australia) shows that multiple different species of big fin reef squid occur in the same localities, it will be interesting to observe if there are corresponding differences in reproductive behavior and characteristics! Now to comb through all the footage and document specific patterns, postures and behaviors! Failsafe option – film with both cameras! In between these dives, I was frantically trying to take growth and reproductive index measurements on all the squid I had bought in morning. Frantic, not because of all the measurements to be taken, but because I wanted to get them processed so the kitchen could cook it! At every location I go to for research, I collect 50 specimens from the local fish markets and take different measurements to help inform patterns of growth and timing of maturity for the three different species. Second, I dissect out the stomachs of each squid to be taken back to the lab for diet analyses. Normally I find any place I can to do this messy, inky, dissections (e.g. showers, an abandoned table on the beach, piers) without making too much of a mess, but the lovely staff of Lembeh Resort set up a little “laboratory” for me to work on with a large freezer for the samples! I feel so spoiled! 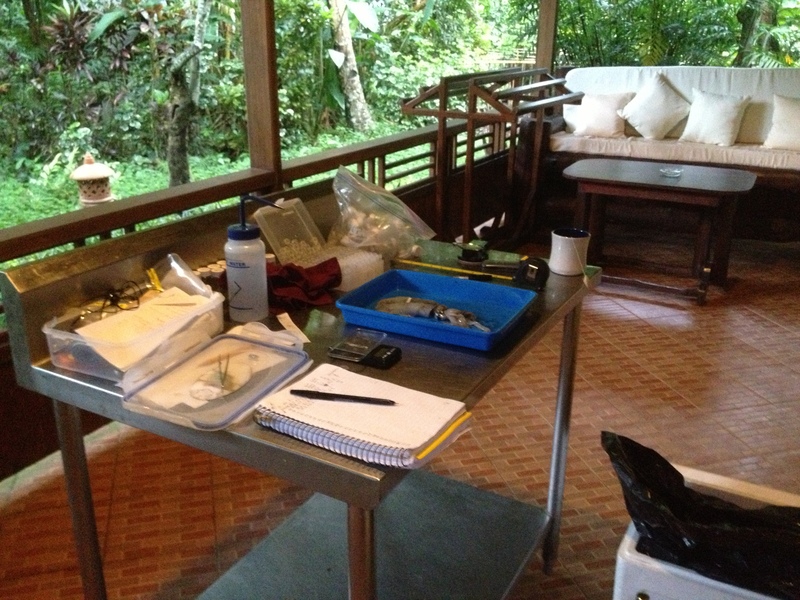 My temporary lab courtesy of Lembeh Resort! After hunting for some more eggs laid in different habitats in the afternoon on SCUBA, I finished the last squid dissection just in time for a drink and dinner! All in all, it’s been a squidful day. Mass of big fin reef squid eggs nearing hatching – mooring line at Lembeh, Indonesia. The small white specks in the egg capsules are individual squid hatchlings (called paralarvae). Fingers crossed I get to see them hatch while we are here! We arrived in the wee hours of the morning to Lembeh Resort on Lembeh Island in Sulawesi Utari province after a typically long debacle of delayed flights. Despite the sleepless night, we jumped right in this morning to begin the hunt for spawning big fin reef squid and their eggs. With the help of Dimpy, the resident marine biologist, and the fantastic dive staff at Lembeh Resort, my first day was absolutely full of eggs! 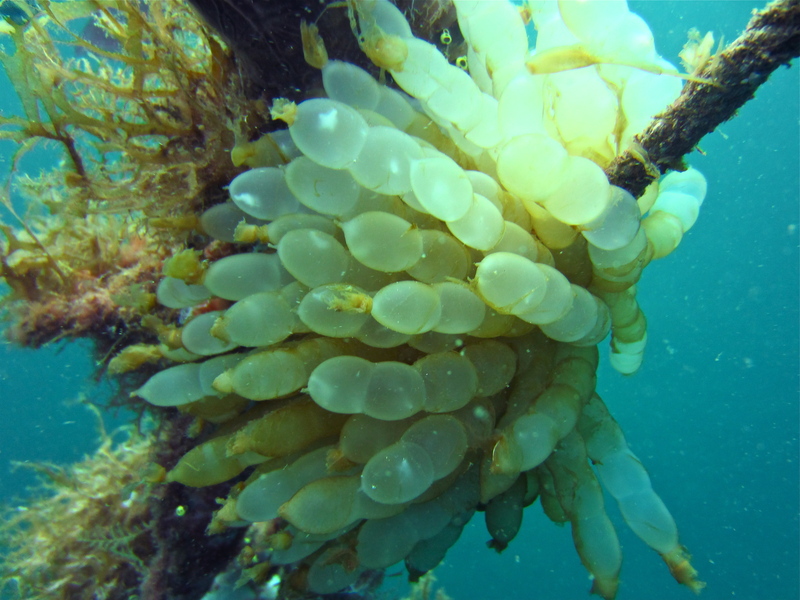 All in all, 82 egg capsules containing ~ 420 eggs at different stages of development were collected from 12 separate egg masses on the mooring lines, and that doesn’t even comprise 5% of the egg masses that were there! On a very interesting note, while squid are known to spawn on the mooring lines in Lembeh, they usually prefer to lay their eggs in more protected areas, such as within beds of branching Acropora corals, the undersides of dead corals, reef crevices and in and amongst seagrass beds. Dimpy spotted some a few egg capsules cemented to the tiniest pieces of substrate on the sandy slopes, completely unprotected. It will be interesting to see if these differences in egg laying habitat are correlated with the different species of big fin reef squid! More updates later! We have 9 more days and lots of more squid and eggs to come.